soybean stem epidermis. Rock County, MN. A new potential pest, the soybean (or orange) gall midge, is causing injury to soybean in parts of the Midwest. Reports of this insect from Minnesota soybean are summarized here. Please inform us if you are aware of any additional infestations in Minnesota soybean fields. Earlier this month, we received samples from a Rock County soybean field where stems were infested with small, pale to bright orange gall midge (Diptera:Cecidomyiidae) larvae (Figure 1). These larvae matched the description of the insects causing the recent concern in western IA, eastern NE, and southeast SD. 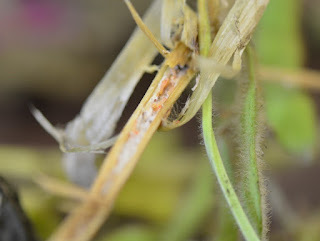 Symptoms include soybean plants brittle near the base, dark lesions on the stem, hollowed pith, larvae under the stem epidermis, and ultimately plant death. In previous years, these midge infestations were associated with injury from hail and disease. Recently, the relationship of infestations to previous stem injury became less clear and this includes the Rock County infestation. Are these insects able to infest plants directly? Other members of this family of flies include the beneficial aphid midge, a predator of aphids, and the Hessian fly, a pest of wheat. Occasionally, similar larvae have been previously observed in MN soybean stems, but at low numbers, and most often associated with hail or other injury. infected plant. McLeod County, MN. Bruce recently visited a McLeod County field with a crop consultant. Here small, orange maggots were associated with Sclerotinia white mold, predominately in the pith (Figure 2). Based on the appearance of the damage and larvae from both locations, they may not be the same species. Samples of larvae from these two fields were collected for future comparisons with specimens from the IA, SD, NE infested area. Since then, a seed company agronomist reported small infestations from Ottertail/Wadena and Stearns Counties. Some, but perhaps not all, were associated with diseased stems. At this time, it does not appear that Minnesota is seeing the same level of problems as neighboring states. 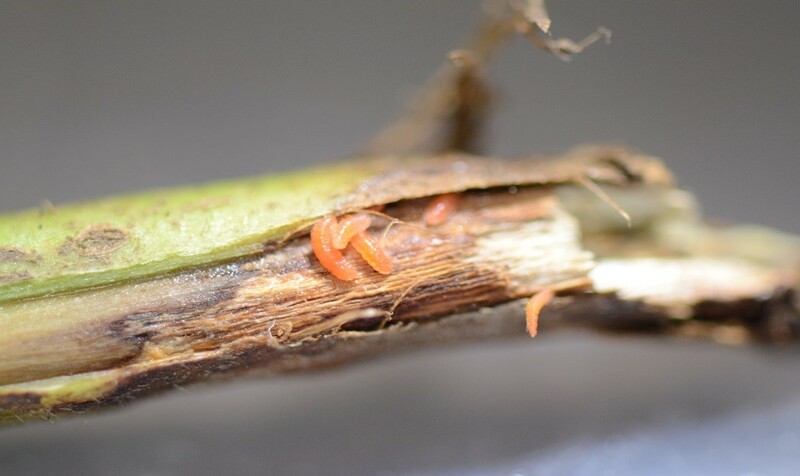 I have included a link to a recent Nebraska publication: https://cropwatch.unl.edu/2018/survey-orange-gall-midge-nebraska-potential-pest-soybeans. Adult gall midges collected from heavily infested fields may soon provide a species ID. Little is known about this insect’s biology. Does this insect pose a long-term risk to soybean production? Will this insect persist in areas where it currently causes economic concern? Will the gall midge eventually cause problems over a wider geography, including MN soybean fields? What management tactics are effective? Research will help define the species involved, economic risk and management strategies. In the meantime, if you notice soybeans with symptoms and maggots resembling the gall midge please let Bruce Potter (bpotter@umn.edu) or Bob Koch (koch0125@umn.edu) know.